If you appreciate the work that has gone into this mod and can afford it please make a donation by pressing the Donation button in the top right corner at www.eoaa.org thanks. I cannot tell you exactly how many hours have gone into this mod but it is more than 100 for sure. The installer for this mod will abort if the original GTR2 DVD or CD is not in your CDROM drive. Please buy a copy! There is a single installer which works for five different versions of GTR2. If you have the 3 CD version of GTR2 please insert CD2 before installing this mod. If the installer doesn't work for you even though you have inserted you DVD or CD please send an email to admin@eoaa.org. (Some sites are still hosting the old 349mb installer which works for only three versions of GTR2. If your installer aborts, try downloading the 317mb installer from any of the links here at rFC, it works for all known versions of GTR2). The CDROM verification is for legal reasons. It will not ever be removed unless someone can make these cars to the same standard from scratch. GTR2 is affectively a rFactor mod, buying GTR2 means you would be supporting a mod team (Simbin). Also if Simbin continue to pay for a license to use rFactor you would be supporting ISI too, looking at the GTR Evolution physics files, it's clear they are still using rFactor code. If Simbin want true realism, well they ought to stick to their roots, work with and support ISI. ISI have the experience, skill and talent to take it in the right direction, I'm not saying Simbin don't only that two minds are better than one. There are Dunlop, Michelin and Pirelli tyres for each car and also three compounds soft, medium and hard for each brand of tyre. The following cars are included. If anyone with modeling skills is interested in updating or making new models, please contact admin@eoaa.org. The installer for this mod installs only files and folders and creates one registry entry inside one registry folder, all of which are removed post uninstalling the mod. No start menu entries are installed. To uninstall the mod please use Uninstall EOAA GT.exe located in your rFactor root folder. Please note that all EOAA installed folders are completely removed during the uninstall process regardless of their being new or edited files/folders present. Patches will no doubt be added to this mod. Patch versions progress as follows V1.01, V1.02, V1.03, V1.04. If you miss a version of a patch i.e. you have V1.01 patch installed but now V1.04 patch is available, well don't worry the latest patch always contains all files from all previous patches. So as long as you install the current main installer and the latest patch you'll be fully up to date. This mod includes original sounds and physics. We started working on the physics back in February 2008. There are working glowing brakes (although they have to be really hot, 500 to 600 to glow fully) and also dirt build up on the windscreen (takes about 40 minutes for the animation to reach the final texture). The mod is designed for leagues, it couldn't be easier to add new cars and new teams. Within each Vehicle folder is a Test drive team, each Test drive team is an example and intended as a guide to refer to when adding new teams. Some Test drive folders have an instructions.txt file in them if there are specific instructions which need to be followed. The GenString notes in the veh files explain which GenStrings you can alter (altering GenStrings which are not mentioned is not recommended, the best models have been chosen and only those models have been updated). Much testing has gone into the pace car and full course yellow settings it basically works if the following is understood (see Formation start and Full course yellows sections) http://www.eoaa.org/main/rFactor/rules.htm. The head physics are completely new and have been created to try and improve the sense of G force. They were created using 50% head movement and +50% exaggerate yaw. For detailed car specifications, guides (including realfeel FFB settings) and templates please refer to http://forum.eoaa.org/index.php?board=41.0. New templates have been made for every car and must be used because the specular maps have been updated for all models and the specular maps tie in with the new templates. The physics have been made using carFactory http://www.kangaloosh.com/cms/Welcome/Download/tabid/57/Default.aspx (thanks to Kangaloosh for a truly amazing program). The data we fed into it has undergone rigorous testing. Trigonometry was used to calculate and set push rod angles in the hdv. The tyres and engine files have been made using Trex (a beta program for advanced physics editing). Trex uses wheel specifications i.e. tyre width, tyre profile and diameter to calculate the majority of values. carFactory uses the exact same wheel specifications to build the suspension which means the tbc files are in sync with the suspension model files. FactorUserDataYourNameYourName.plr under DRIVING AIDS. Auto lift automatically cuts power on upshifts, auto blip automatically blips or revs the engine on downshifts for smoother transmission. In real life some of these cars have full semi automatic transmissions, some have quarter automatic transmissions i.e. auto lift enabled but no auto blip. With auto blip disabled you must blip the throttle on downshifts so that the engine revs match wheel speed, if the engine revs don't match wheel speed the rear wheels will spin and cause the rear to step out quite severely. Likewise if auto lift is disabled and you don't manually lift the rear wheels will snap and loose traction on upshifts because the engine revs are too high. Nearly all modern GT cars use an electronic cut for upshifts i.e. auto lift=1. I use the above settings and this is what's used by most teams in the FIA GT. Regarding the sounds, some might say they are too quiet. Well the problem is not that the samples are too quiet, the problem is that a typical sound card cannot amplify them enough. The samples are already at 100% volume, if I increase the volume any more they will start to clip and distort. Many people add distortion to boost the volume but then quality and detail is lost. I prefer to keep original quality and detail and then use my stereo amplifier to increase volume. Sound cards have great quality but they do not for some strange reason make very good amplifiers. However you can make adjustments to the volume by editing the sfx files. Increasing playerEngineVolumeMinimum=1.0 will increase off throttle sounds, 1.0 is maximum volume. Also there is a neat trick whereby adding a multiplier at the start of the search path allows control over volume for example ..
Increases the volume for this particular sample by 10%. Increasing the volume too much will introduce distortion, some samples can handle increased volume better than others. Also please note the comma , after the multiplier. Happy editing although the balance has been worked on a lot. Sounds, physics, compilation and installer. carFactory author (physics) and advice. Trex author (physics), advice and support. For creating GTR2 and such beautiful models. Come on (let the good times roll). Regards, European Online Autosports Association. S7R and MC12 have less power, S7R has an additional 30kg. All tyres have about 2% more grip, this results in faster lap times. The reason for doing this is because we tested using Brno which is a GPS track by Simbin and is very accurate. Lap times with V1.06 were about 3 or 4 seconds too slow, the increased grip means lap times are now about 1 to 2 seconds too slow. We decided not to add more grip because in order to get the most out of the tyres there must be a little slip and increased grip means it's harder to slip the tyre, the only solution is to use stronger springs however if we had used grip levels that produced realistic time (1m51 to 1m52) the springs would need to be almost 400nm. There are some unrealisticly bumpy tracks in rFactor so we decided to only increase the grip a little. The new tyres will require slightly stronger springs in order to make the tyre slip more. Updated brakes, previously the cars used BrakeDiscInertia=0.001 this causes brake torque to change too easily. Now using BrakeDiscInertia=1.1 which results in much more predictable and consistant braking. Lister has completely new engine with specs 595 Bhp @ 7400 Rpm 775 Nm @ 4700 Rpm. All tyres have increased optimum camber angle and increase gain at optimum camber angle. This makes the cars more predictable when sliding sideways and a little faster in turns. All diffusers now produce about 2000N or more at 200Kph. All cars have optimised aerodynamics for better balance and handling. Damage fine tuned, less likely to damage aero, more likely to damage suspension. All in all this is mostly a physics update and although the cars were quite a nice ride previously in V1.06, well the optimised aero and brakes, increased grip and new camber settings really puts the icing on the cake. C6R added. 60% more downforce to reduce excessive high speed with minimum wing, more downforce means more drag. Instead of guessing the downforce at a particular speed we decided to reverse engineer downforce from speed and lift/drag ratio. A reasonable top speed for these cars is 315kph with minimum wing, we already know the lift/drag ratio, therefore downforce can be calculated as for a certain speed a certain amount of drag is required. The result is about 60% more downforce. Because of increased downforce, decreased roll center heights. Updated tyre wear, tyres have about 200% more wear now and the rate at which a tyre wears is slightly less - you can use 1x tyre wear now. Fixed AI pitting after 1 lap. Updated DBR9 specular colour and specular power so that the model looks like all the other cars. Updated cockpit positions for all cars, positions are now suitable for both 4:3 and widescreen resolutions. S7R +20kg. All soft tyres have increased wear. Wear graph updated, please refer to reply #3 here http://forum.eoaa.org/index.php?topic=347. Clutch physics updated for all cars (less likely to loose traction shifting from 1st to 2nd). 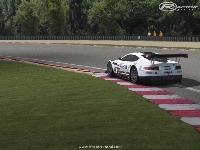 DBR9 template updated (has updated rear wing shading nothing more). F550 and F575 templates updated and test drive skins updated (perfected shading for rear lights) specular maps updated too. S7R style 5 template updated (black parts section overlapping right mirror causing black line, Michelin test drive skin updated). Lister template updated and test drive skins updated (rear shading cleaned up and texture for flick switch thing at rear positioned properly) specular map updated too. Viper wheels issue fixed. 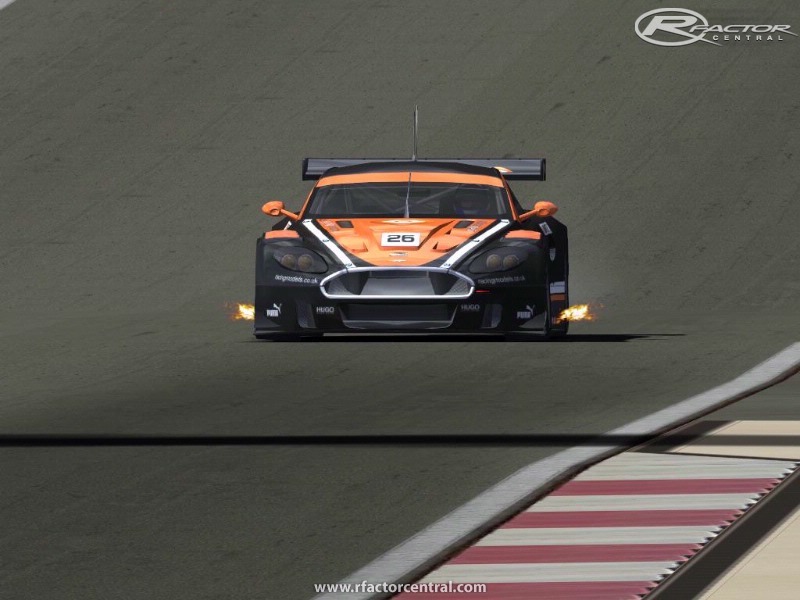 R-GT lights issue fixed. 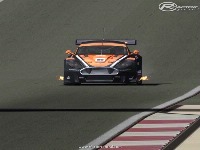 DBR9 had 10% drive train loss, now has 9%. C5R had 9% drive train loss, now has 8.25%, limiter increased by 100 Rpm, much improved fuel consumption (now has the best fuel consumption because it uses Lemans engine specifications), engine heating increased, can use radiator setting 2 and maintain optimum oil temperature. Viper drive train loss was 9% is now 8.5% and limiter increased by 100 Rpm. MC12 drive train loss was 11% is now 10.5%, wcextra2 is now used for front radiator grille. Fuel estimates disabled for all cars, they were completely inaccurate previously and they cannot be set accurately for all types of tracks. To find out exact fuel consumption use MoTeC http://forum.eoaa.org/index.php?topic=320.0. Michelin and Pirelli wheels updated for S7R. 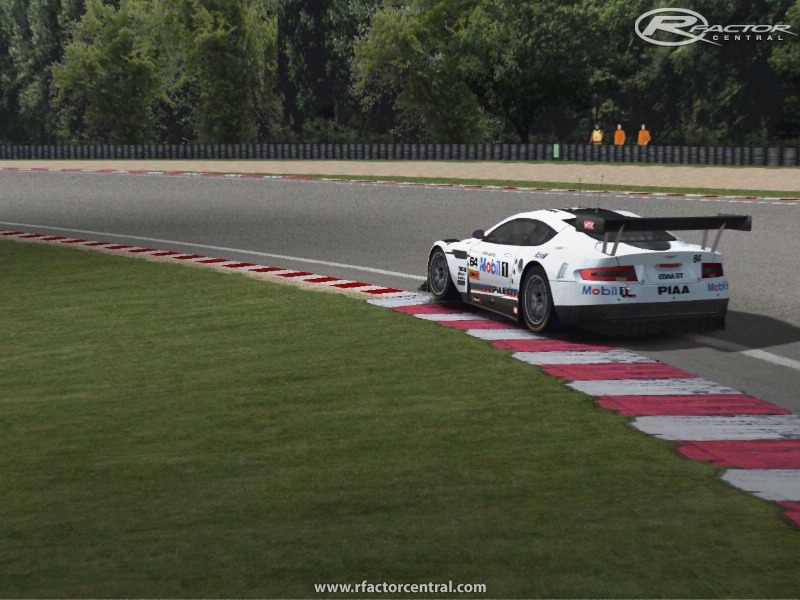 Fixed Lister rear wing emap issue, fixed Viper test drive backfires, fixed F575 dirt screen issue, updated F575, R-GT, MC12 and S7R specular maps (full detail 2048x1024, were half size previously). Changed genstring to 5 for F550 chassis (5 is also for hood, use 1 for 2003 hood and 4 for 2004 hood, template updated with 2003 hood options and updated parts for rear lights (edges more rounded), test drive genstring notes updated in veh files, test drive skins updated. F575 has emap removed from meshes (behind front wheels and front radiator mesh) template updated with new parts for rear lights (edges more rounded), test drive skins updated. Updated Lister template and test drive skins, rear lighting and bumper tidied up, specular map updated too. Viper genstring 2 used for body and backfire, 3 is exhaust near rear wheels, 5 is exhaust at center of car, test drive genstring notes updated in veh files. R-GT Dunlop tyres updated (style 2), two chassis styles now available (first genstring is for body, 1 has different rear section to 2) template updated with shading for each style, new lights style added (seventh is for rear brake lights style, use 1 for round 2008 style and 2 for factory style), test drive genstring notes updated in veh files. S7R templates updated, tidied up rear brake lights section, fixed bug where cockpit splitter loads when not in cockpit. Updated many wheel rims and new emaps for cars, they look much less flat now. Fixed S7R LOD C style 6 headlights, fixed DBR9 genstrings for correct tyre graphics, fixed DBR9 backfire causing rFactor to crash, updated DBR9 lights front and rear, fixed C5R lights style 2 and now using for all teams, C5R specular map updated to include front lights cover with Corvette text, Viper body style 3 added which has the backfire hole further towards the rear wheels (style 3 template now available please download Viper templates again), Viper tow hooks fixed and looking correct. DBR9 has more engine power and power curve more rounded, C5R more engine power, Viper updated power curve, F575 updated power curve, Lister more power post peak power, MC12 -20kg. All tyres have very minor tweaking for improved balance. SemiAutomatic=0 for all cars now (please refer to paragraph starting SemiAutomatic=0 in read me for help with this). Fixed Viper LOD issue, fixed DBR9 backfire, fixed MC12 headlights, fixed S7R LOD issue, high detail specular map added for Lister, improved R-GT wheels, default rear damper settings for Lister updated. Slip curves updated for all tyre brands (longitudinal fall off much more gradual, prevents tyres locking up too easily. Michelin now has the most amount of lateral fall off followed by Pirelli and then Dunlop). Please note that all curves use Pacejka formula using http://www.rfactorcentral.com/detail.cfm?ID=Tyre%20SlipTable%20Maker. Headlights beam updated, it's brighter and more detailed. S7R Pirelli livery changed to blue. All cockpitinfo.ini files updated to include new cockpit Eyepoint positions (further back to allow for a better view of mirrors). EOAA.cam updated (exactly the same as the cam fix which was available earlier). Skid sound updated (exactly the same as the skid sound update which was available earlier). Maximum steering lock set to 23' for all cars, please note that the tyres start to smoke and loose excessive grip when steered beyond about 15' and above 55kph. To avoid smoking tyres here are some recommended wheel settings. Thanks goes to LesiU from the SimRacingPL community for helping create the new cockpit positions. The skin pack consists of some real and some fantasy liveries. Install the skin pack to your root rFactor folder. An uninstaller is created in your rFactor root folder called Uninstall EOAA GT skin pack.exe. Uninstalling the skin pack removes all Skin pack teams folders, it does not remove any of the core EOAA GT files. Updates will be made to this skin pack but you do not have to uninstall the previous skin pack before installing a new version, simply install over the top of the previous version. If you intend to uninstall EOAA GT completely, please uninstall the skin pack first and then uninstall EOAA GT. Consider this skin pack as part of EOAA GT when making your votes. I still doesn't understand what you are talking about. Check out deer hunting games free. EOAA GT 1.07 link depositfile is dead. New link please thank you. I love playing this mod except for one thing.....the AI behaviour is crap. If you pass a car and there are still others in front of you, those in front actually slow down and box you in so that the car(s) you passed re-pass you. And then the ones that slowed take off like jackrabbits and within 2 corners are usually 2-3 seconds (sometimes up to 5 seconds) up the road. And if you are being passed, most of the time the AI gets halfway past your car, they then turn into it and you end up slowing. Add an option called "Check for Steam version instead", then the user will be prompted to select the "Steam\SteamApps\Common\GTR2" folder and so can continue the installation. It is useful for who has the Steam version but not the CD/DVD. The Steam version is very cheap! Another good suggestion would be a "cracked EXE detector" (the installation aborts if the selected GTR2 folder has an EXE detected as cracked). Choosing work route that's each efficient as well as satisfying is probably the most important decisions a person makes inside their entire living. However, young folks are facing this specific choice at any time when their very own self-understanding and knowledge of the planet of work is very meagre. Every day wellness assessment will help you manage your own wellness. While many individuals believe their very own health is completely from the hands, that is far in case. When a person begins to look at the state from the health as well as the state from the well-being, they might realize they need to make a difference. But without any base related to comparison, it might be difficult to look for the progress in the changes these folks do help make. I've already been on several Free organization start-up applications, so All of us was really clued up in regards to the importance of creating one. Nonetheless, the main point these programs anxious was that you just needed a business plan in the event you were prone to approach the particular banks as well as other businesses for financial assistant. They might be made via wool in addition to cashmere too, but 100 % 100 % cotton and silk tend to be common as well as popular.